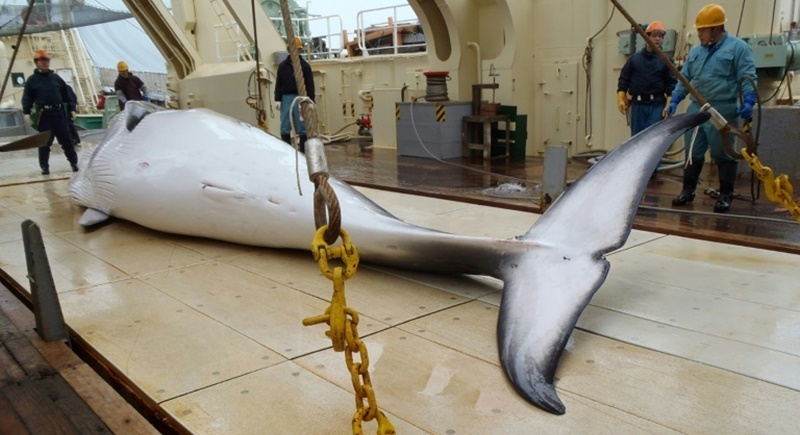 JAPAN: Japan killed 122 pregnant minke whales during a highly controversial annual whaling expedition that Tokyo defends as scientific research but conservationists call “gruesome and unnecessary”. The four-month expedition in the Antarctic ended in March after the fleet killed 333 minke whales, according to a report submitted by Japanese authorities to the International Whaling Commission last month. Of those, 122 were pregnant, according to the Japanese report, with dozens more immature whales among those killed. Humane Society International, a conservationist group, called the figures “a shocking statistic and sad indictment on the cruelty of Japan’s whale hunt”. “It is further demonstration, if needed, of the truly gruesome and unnecessary nature of whaling operations, especially when non-lethal surveys have been shown to be sufficient for scientific needs,” said the group’s senior program manager, Alexia Wellbelove. Japan is a signatory to the International Whaling Commission, which has maintained a moratorium on hunting whales since 1986. It makes no secret of the fact that whale meat ends up on dinner tables. In 2014, the International Court of Justice ordered Tokyo to end the Antarctic hunt, saying it found permits issued by Japan were “not for purposes of scientific research”. Tokyo cancelled the hunt the following year, but resumed it in 2016, also killing around 300 minke whales. You mean the ILLEGAL Japanese whaling, their entire fleet should be torpedo'd & sunk to the bottom of the southern ocean, there is nothing scientific about it. Long live the well managed and sustainable Japanese Southern Ocean Whaling Industry. Many years ago I looked up the publications the japanese get out of whale hunting. The number and quality of the scientific papers is pathetic. Almost none are in respectable ISI rated peer-reviewed scientific journals. I am a research scientist (97 peer-reviewed publications) and I have published on marine mammals.